A senior Israeli army officer has told the BBC that as long as Hamas remains in control of the Gaza Strip, another war is "only a question of time". He said the Palestinian Islamist group had re-armed so much since the Israeli offensive two years ago that it was now in a stronger position militarily. There has been an increase in rocket fire coming from Gaza in the past week. 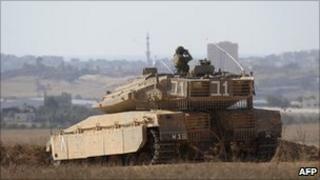 Earlier, Israeli defence officials said tanks fitted with a new missile defence system would be deployed near Gaza. The announcement came after Palestinian militants for the first time used a Kornet tank-piercing missile. On 6 December the Russian-made laser-guided missile - which carries 10kg (22lb) of high explosive - penetrated the tank's armour, but did not injure its crew. The UN has condemned the firing of "indiscriminate" rocket and mortar attacks by militants in Gaza in recent weeks. Israeli Chief-of-Staff Lt-Gen Gabi Ashkenazi said the Kornet missile was "among the most dangerous that we have seen on this front and was not used even during the Lebanon war". "The situation in the south is very fragile and explosive," he warned. Speaking to the BBC's Jon Donnison on Wednesday, another senior Israeli army officer from the Gaza division said: "As long as Hamas remains in power, it is only a question of time before there is another conflict." Palestinian negotiator Saeb Erekat also warned that tensions were escalating in the region, and that any Israeli attack on Gaza would only lead to further bloodshed. "Military solutions such as these won't achieve anything and will only complicate the situation," Mr Erekat said. The Israeli-developed active protection system (APS) - known as Trophy - is designed to destroy missiles like the Kornet. The system, which has so far been fitted to a battalion of Merkava Mk4 tanks, uses radars and sensors to identify threats, then releases special explosives to neutralise them. No Palestinian militant groups has claimed the attack. Hamas is not thought to have been behind the increased rocket fire from Gaza this week, to which Israel retaliated with air strikes. However, Israel has said it will increase attacks on Hamas facilities even if the movement is not directly responsible. The Islamist group has controlled Gaza since June 2007, after winning elections in 2006 and then forcing its secular rivals Fatah, the party of Palestinian leader Mahmoud Abbas, out of the territory. The UN has said at least 62 Palestinians have been killed by Israeli action in Gaza so far this year. Over the same period, one Thai farm worker has been killed by rockets fired from the coastal territory into Israel. Two years ago, a 22-day clash between Israeli forces and Palestinian militants in Gaza left an estimated 1,300 Palestinians and 13 Israelis dead.